DESCRIPTION AKA The Calypso Caper White from the family Pieridae. 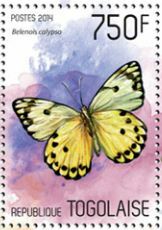 Crisp black and white with a touch of buttery lemon wing colours on the verso of this delicate butterfly. Found across Africa from drier forests to the edges of wet forests this butterfly has a wingspan of up to 4cm.